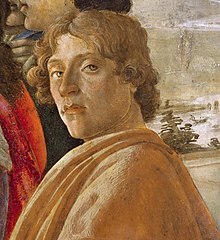 Alessandro di Mariano di Vanni Filipepi, kent as Sandro Botticelli (Italian: [ˈsandro bottiˈtʃɛlli]; c. 1445 – Mey 17, 1510), wis an Italian penter o the Early Renaissance. ↑ 1.0 1.1 Patrick, Renaissance and Reformation vol 1, 2007. Ither soorces gie 1446, 1447 or 1444–45. This page wis last eeditit on 28 Mairch 2015, at 14:26.